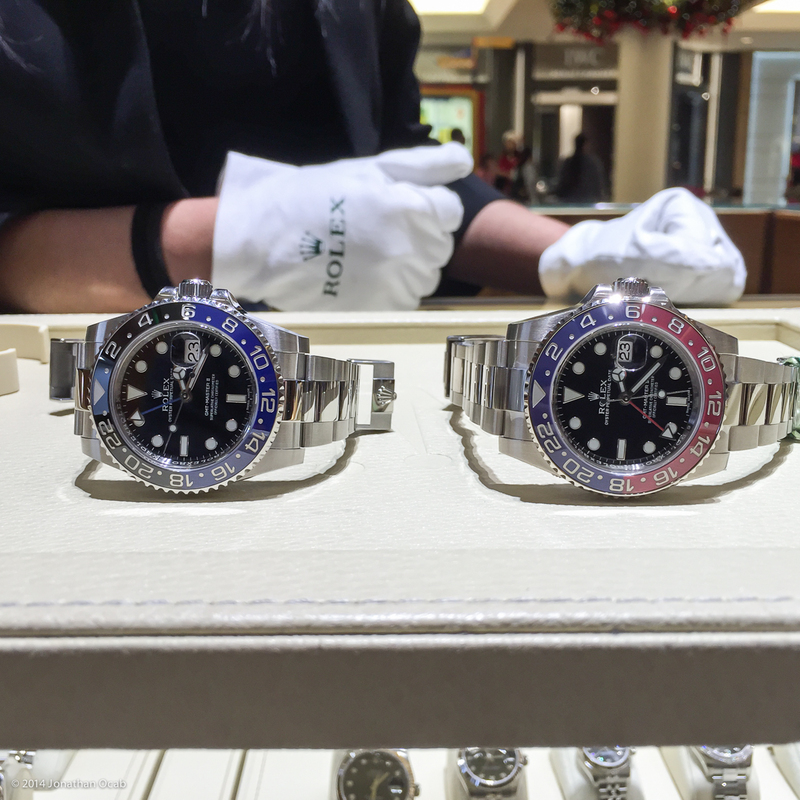 Last month when I stopped into the Rolex Boutique (by Baron and Leeds) in South Coast Plaza (Costa Mesa, CA), they had the GMT-Master II 116719BLRO aka ceramic Pepsi bezel in white gold on display, and I took a photo of it. I realized shortly after that the photo wasn’t a good representation of the colors (at least on my calibrated computer displays). Also, at the time I was there, I wasn’t wearing my 116710BLNR (blue-black), so I couldn’t take a side by side comparison photo (they didn’t have a BLNR in stock, which is surprisingly enough, still hard to come by in high traffic Rolex authorized dealers). Today I happened to stop by and they still had an 116719BLRO in the display case and I fortunately was wearing my 116710BLNR during my visit, so I was able to take a side by side photo of the BLNR and BLRO. As you can see above, the blue on the BLNR is a lot more deeper and vibrant than the blue on the BLRO, which appears darker and less saturated, so to speak. Also, the blue and red are both more ‘muted’ than you would expect. That is to say that the bezel’s red and blue colors seem flatter than glossy. This photo is more truer to life than my previous photo from last month in terms of the colors. Plus, even without correct color temperatures, this photo will help those who have already seen (or own) an 116710BLNR to have an idea of how the 116719BLRO compares with regards to the blue. My watch on the left in the above photo has the correct time, both local (PST) and GMT, to the second (according to atomic). One other point to note is that the Cyclops date magnifier on the 116719BLRO appears to have less power/magnification factor than my BLNR, and the other Cyclops date magnifiers on the current production Rolex watches that precede it. It is somewhat perceptible in the above photo, but it is definitely noticeable in person when comparing them side by side. I’m not sure why this is the case, but it has been noticed by other watch enthusiasts who have remarked on this in watch forums. I have not come across an explanation for this characteristic, yet. Personally, even if I had the ~$40K to dump on a watch, the 116719BLRO wouldn’t be a watch I would buy. Frankly, I think the BLNR simply has a better look. If I wanted a Pepsi bezel, I would rather get the last iteration of the stainless steel version (16710 BLRO). I think the 16710 BLRO is more significant now, considering Rolex pretty much closed the door on future stainless steel Pepsi dial GMT-Master II watches (by going to white gold, Rolex has never gone back to stainless steel for the same style watch), and the 16710 BLRO will continually increase in collectibility value. Good write up. If they made the BLRO in stainless and released it at the same time as the BLNR which one would you have gone for? I probably would have bought the BLRO, but would have ended up buying a no-date Submariner (or some other all black, or mostly black watch) sometime after for something more subtle. you mentioned that once Rolex made a gold version they never went to SS. what about the Smurf? that blue dial/bezel sub came out in white gold and a few years later was made in SS. they may do the same for this! The blue Submariner is either white gold or two-tone. The only SS blue Submariners I’ve found on the Internet are unauthorized custom made ones where the black dial and bezels were swapped out for the the blue parts. that’s the ones I saw, around 6k. they looked good!